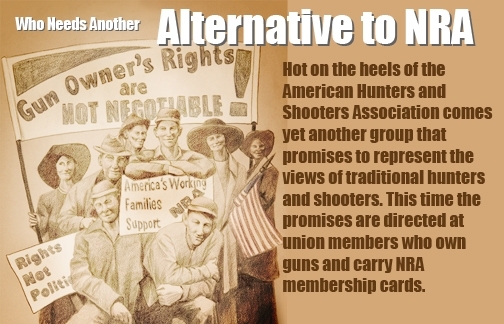 American Rifleman readers know well the background behind the recent emergence of the American Hunters and Shooters Association (AHSA), an outfit that shamelessly promotes itself as an "alternative to the NRA." But this billing reminds me of the old saw: "With friends like these, who needs enemies?" The AHSA staff and leadership roster read like a Who's Who of the gun ban lobby and its financial supporters, and the group is performing predictably. AHSA's debut performance was in the 2006 Missouri Senate race, when the AHSA Foundation financed a direct-mail attack on NRA with a piece that screamed from its headline, "The NRA Is Selling Us Out!" It falsely alleged that "NRA is supporting politicians who are trying to take away our access to public lands" when in fact NRA is leading the charge to protect hunter access to public lands. Ironically, Missouri is a showcase of NRA's conservation work. As a proud partner of the Great Rivers Habitat Alliance, NRA-ILA is working specifically to save hundreds of thousands of acres of wetlands throughout the state from going under the developers' bulldozers. AHSA, on the other hand, claims a few hundred members and has done precisely nothing to protect wildlife habitat and hunter access. So it should come as no surprise that AHSA's debut in the Second Amendment debate featured AHSA President Ray Schoenke standing shoulder-to-shoulder with New York City Mayor Mike Bloomberg in a Washington press conference, where the mayor demanded that Congress lift critical privacy protections from BATFE trace data. Schoenke proclaimed "we are a gun rights organization" at the same time he supported destroying your right to privacy by exposing your retail gun purchase records to fishing expeditions by lawsuit-happy mayors. The bombast of their direct-mail attack on NRA proved that their promise to avoid "angry political rhetoric" is as empty as their slogan "Protecting our gun rights and the lands we love." AHSA is no more than a shell operation for laundering the personal wealth of major gun control backers into the battle against our rights. The group is a decorative bauble on the emperor's new clothes, ready to be shined up and trotted out whenever the enemies of freedom perceive a tactical need to claim the support of the very groups they are working against. So is it mere coincidence that recently yet another group has formed to promote itself as (you guessed it) an "alternative to NRA?" A recent article in The Washington Post breathlessly announced the formation of the Union Sportsmen's Alliance (USA). A joint effort of the Theodore Roosevelt Conservation Partnership (TRCP) and some 20-odd labor unions, the USA is intended "to lure the political allegiance of gun-owning union members away from the NRA and its political agenda." Harold Schaitberger, president of the International Association of Fire Fighters, told the Post, "We know that the NRA is communicating to our members what clearly are anti-union positions and urging them to support anti-union candidates." He went on to say that USA "is about connecting with our members, doing good conservation work, and offsetting some of these anti-union messages they are getting from the NRA." I challenge Mr. Schaitberger to cite one instance of an "anti-union message" from NRA. He won't find one, since labor issues are well outside our single-issue mandate. As for supporting anti-union candidates, that is purely the result of political reality. The truth is that the vast majority of union political support goes to candidates who actively work against our freedoms. There's nothing we can do about that except continue to oppose all candidates who would diminish Second Amendment rights and continue to speak the truth to union members. Here's the real rub--the unions conducted a poll and told the Post: "The poll found that about a quarter of union members said they belonged to the NRA, an affiliation that displeases some Democratic union leaders." The substantial support that NRA enjoys from America's working families is not something that strikes me as a problem. What is our problem is the growing field of entities--even if they exist just on paper--who claim the support of gun owners and hunters, while quietly admitting their true agenda of working at cross-purposes to our mission. Even the jaded cynics at the gun-ban group Violence Policy Center are giddy about the prospects for the USA, while admitting that the "alternative to NRA theme" is now thoroughly discredited. VPC's Josh Sugarmann wrote in his blog: "The gun debate is littered with defunct organizations that promised to represent the views of traditional hunters and shooters and stand as ‘the good NRA.' "
Littered yes, but they are not all defunct. AHSA and USA are merely the latest false claims made upon the stake of our rights and our hunting heritage. These groups are no more an "alternative to NRA" than censorship is an alternative to free speech.